Hotel Louren, Prague. Louren Hotel Prague. 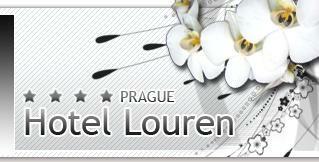 The Louren hotel is situated in the peaceful quarter of Prague called "Kràlovskè Vinohrady". The hotel is far just few steps from Wenceslas square, and just 5 minutes far by the metro from the Old Town. A refined and luxurious hotel, it is the ideal place to spend a wonderful stay in this unique city. Our personal is pleased to welcome you in this renewed building, and ready to take care of every guest individually. But the feather in our cap are the 20 elegant rooms, accurate down to the smallest detail and provided with all the modern facilities, that guarantee our guests the perfect place to relax in a quiet atmosphere. Furthermore, you have at your disposal the Louren restaurant, that with its classical style and friendly ambience, assures you delicious menu for dinner and lunch (available also for groups only on request). For breakfast, we offer a sumptuous buffet with both the typical English and continental dishes. Breakfast is serviced from 7.00 am to 10.00 am.